AI is hard. AI in a regulated environment is harder. Over the past 12 months, every PV gathering I’ve gone to has had multiple tracks, sessions, and keynotes discussing the benefits that artificial intelligence and machine learning will bring to pharmacovigilance. From case processing, to signal management, to regulatory reporting, AI is being billed as a panacea. Everyone wants to talk about it, explore it, and test it, but, few have deployed it. The reason? AI is hard! And AI in a regulated environment is even harder. Regulatory requirements expect predictable and repeatable results from a validated system. However, with AI it is difficult (maybe impossible?) to document the steps a machine has taken to arrive an outcome. I think before we see wide scale adoption of AI in PV, we’ll need to see a lot more research come out at conferences like DIA-PVRMS, providing evidence of validation and other best practices. Real-world data (RWD) for pharmacovigilance is coming of age. 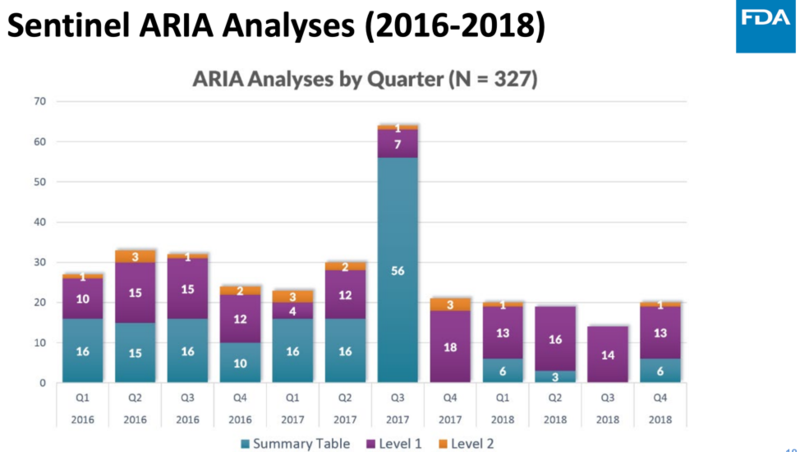 Representatives from FDA presented at several sessions on their use of RWD with Sentinel and the ARIA tools, as well as the new BEST initiative with EHR data. In the chart below you can see how many analyses they have run since Sentinel went live. It’s interesting to see that the number of queries has gone down over time. One explanation for this may be that the researchers running the analyses now better understand the capabilities, and limitations to the program. Going forward, FDA stated that they are exploring opportunities to leverage advances in machine learning, natural language processing, and artificial intelligence to advance the system. They are also looking at ways to leverage EHR data, no doubt looking to learn from the BEST experience. Industry stakeholders seem to be heading in the same direction, albeit with caveats. Aggregated datasets and advanced linking technologies allow for similar types of “rapid queries”. What will be important for a pharmaceutical company is how and if the results of those queries fit into their current signal detection and management workflow. How can a medical reviewer know the same information as the data scientist that ran the study? It seems that software that can integrate these types of data and results in a GVP compliant way will need to become standard to continue the push with RWD. Stakeholders are ready for new pharmacovigilance software. The Advera Health booth was busy this year and it wasn’t just to taste good wine. Key industry stakeholders see the immediate opportunity for pharmacovigilance software to better interact with traditional data sources like ICSR databases, FAERS data, VigiBase, and clinical trial data, but also with sources similar to those used in Sentinel and BEST. Bringing these pools of information together creates an opportunity to enhance signaling algorithms, make validations and assessment more efficient, and ultimately get answers to drug safety questions faster. The market for pharmacovigilance software is evolving quickly. What the 2019 DIA-PVRMS conference proved to me was that industry leaders are more willing than ever to look past legacy systems and focus resources on building a system of intelligence that will drive pharmacovigilance workflow for years to come.